RAMALLAH, Palestinian Territories — A Palestinian teen jailed for slapping an Israeli occupation soldier near her home in the occupied West Bank lost an appeal on Wednesday for her early release, her supporters said. Ahed Tamimi’s case gained international attention when footage emerged of her slapping and kicking two Israeli occupation soldiers next to her house in the West Bank in December, with the soldiers not responding to the provocation. 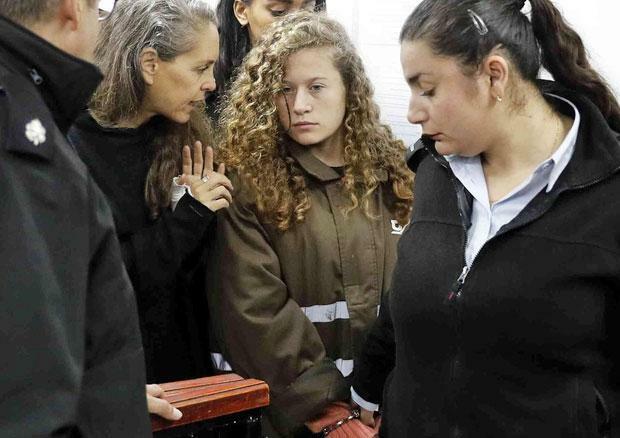 Tamimi was later arrested and eventually accepted a plea bargain in which she was sentenced to an eight-month prison term due to end in mid-July. Critics of Israel have contrasted her eight-month sentence with the nine months eventually served by an Israeli occupation soldier who shot dead an injured Palestinian attacker as he lay on the ground. On Wednesday, an Israeli parole committee rejected the 17-year-old’s appeal for early release, said a spokeswoman for a group campaigning on her behalf. There was no immediate confirmation of the decision from the Israeli side. The video of Tamimi’s confrontation with the Israeli occupation forces went viral, with some Israelis saying it was an example of Israel not responding to “provocations”. she repeatedly told the soldiers to leave her land, which is considered occupied under international law. A cousin of hers had been shot in the head earlier in the day by Israeli occupation soldiers, her lawyers have said.